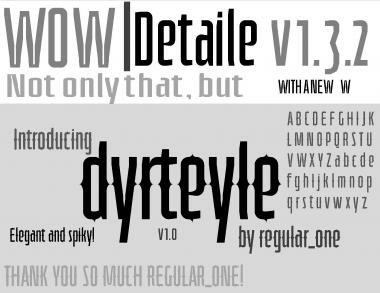 See also dyrteyle' by regular_one, broken line by MaluMP, Detaile' 2.0 by Agent Demonic Ladybug. A stylized Industrial Sans on 2:2. Info: Created on 27th August 2011 . Last edited on 19th November 2011. I like it...... I like it a lot. Thank you! v, w are a bit too wide though. Nothing much you can do about it when using 1:8 bricks. The improvement in your style is coming along nicely, as is the awareness of your letter proportions. I think you'd be able to scoot the right half of the v over one grid space to the left and it would be okay. On the w, you may have to thin out the middle so the weight remains balanced. Good filter work. Wow, thanks! Is this what you mean with v, w? My personal faves are a, c, g, s, t, 5. I live everything about this, except maybe for the y. But I'm not sure about an alternative either. Better, but not quite what I had in mind. Having the bottoms of the v, w, and y disjointed at the bottom differentiates these glyphs from the rest of the font. It's not that it's wrong for me, but I see an entirely new font that can be based out of these three existing letters. Here's some options for the v and w.
Oh thank you geneus1. I appreciate it. Minor changes. 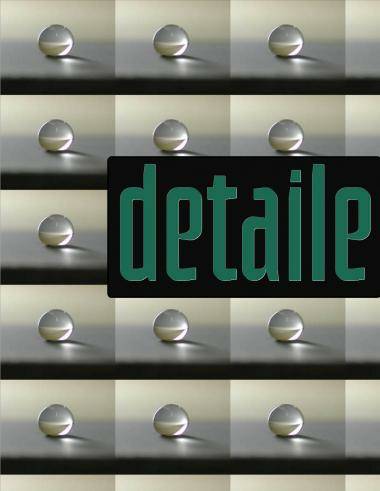 The thing that makes Detaile Detaile is the subtle details, like on the t or the bottom right corner of the m.
Congratulations! FontStruct Staff have deemed your FontStruction worthy of special mention. “Detaile” is now a Top Pick. THANK YOU. I'm working on uc. I beg your pardon. I want to write you: "Still working with it (the UC), please". I like your work, you know. It just was an language error. My native language is Spanish, but about the English, sometimes is more easy to me than this, and I can not understand some of the things they say you usually can stop it! You're welcomed! Ok everyone, I have started the caps. 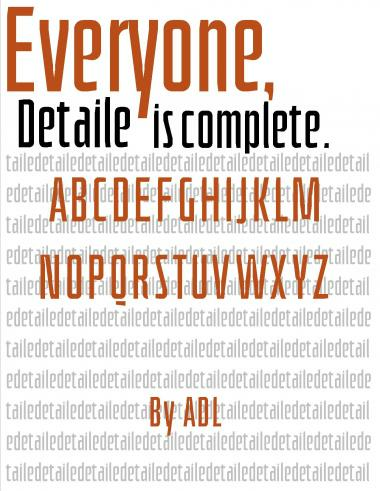 So cool, ADL! Good work. Gotta say this one has been reminding me for a long time of Oz Handicraft, by which I mean a compliment of good association. It looks like there's a spare block on the A. Just cloned this and had a look - there is a triangular brick just above the cross-bar of the A.
I've been keeping track- Detaile' is now the 19th highest- ranking font out of 18811 FontStructions! Wait- did you put the sans serif category on this font, meek?